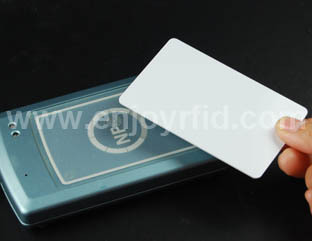 To RFID CARD provide greater flexibility to the fast-growing NFC market, NXP Semiconductors has developed a new series of NFC HF passive RFID chips, which can support such functions as tracking which NFC tags are being used at any given time, off-line authentication via a digital signature, and the ability for a tag to count the number of times it is read. The company has been focusing on NFC technology development for several years, initially with chips for RFID readers embedded in mobile phones and tablets. According to Giancarlo Cutrignelli, NXP’s global marketing manager, the firm has so far sold 100 million such chips for NFC-enabled reader devices. “The market has shown tremendous growth” during the past year, he says. But NXP found that there was a shortage of NFC tag chips which are able to meet the diverse requirements of the NFC applications being launched worldwide. Now, the second generation of its NFC tag chips the four chips within the new NTAG21x family will enable the development of new tags with greater functionality to meet the diverse needs of NFC technology users. The four chips have varying amounts of memory: The NTAG210 chip, with just 48 bytes of user memory, is the least expensive. It is intended for the mass-market use case of tags requiring only a very simple function, such as directing a smartphone or other RFID-reading device to a URL.The NTAG213 model has 144 bytes of memory.The NTAG215 version has 504 bytes.The NTAG216 chip, at 888 bytes, has the most memory. All of rfid inlay these come with functionality that includes mirroring, a serialization service to enable that mirroring, and a counter function to count read taps and authentication signatures for authentication applications that can be read off-line by any NFC reader. NXP also offers a fifth chip, the NTAG 216F model, which is a version of the NTAG 216 chip that provides password protection and sleep mode.